This one almost slipped past me. I knew, of course, that J.K. Rowling had written a detective novel for adults under a pen name, but all I remember reading about it was that fact; there must have been reviews of the book as a book and not a publishing phenomenon but I don’t remember reading any. But if you hang around LibraryThing or any other group of avid readers, you know how it goes: Listen to enough people talking about what they’re reading and eventually all those positive comments start to accumulate even in an overstuffed brain like mine. Off to the library! And you know what? I’m glad I listened to all of you, because this one is pretty darn good. Cormoran Strike is a former war hero-turned-private detective, down to one leg and down on his luck, when a rich client comes to him with an impossible case: Prove that the death of his sister, a world-famous model, was murder and not suicide. Even Strike doesn’t believe it’s true, but he needs the money and brother John is willing to pay. And a funny thing happens on the way to a no-hoper payday: Strike starts to think brother dear is right. Strike is no Sherlock Holmes. There are no wild “aren’t I clever” flights of deductive genius on display, just dogged determination and a tenuous sense for who’s not telling the whole truth. Temp secretary Robin ably plays non-Watson to Strike’s non-Holmes, with parts of the book told from her point of view. Galbraith/Rowling portrays Strike as a bit of a sad sack, reduced to sleeping in his office when he breaks up with his rich girlfriend, but somehow makes him an appealing sack for all of that. I’ve already put myself on the holds list the library for the second in the series, The Silkworm. Another series? When I already have way too many series going (80, according to FictFact.com, and who ever thought that was a good idea, tracking series)? What can I say? I am helpless before the mighty ebook sale tsunami! Alas, this series of mysteries featuring World War I nurse Bess Crawford was worth breaking all my self-imposed rules for. The first book finds Bess, home on convalescent leave after the hospital ship she served on was sunk at sea, traveling to Kent to deliver a deathbed message to the family of a soldier who died under her care. While there, she manages to get tangled in a decades-old murder mystery. As one does, apparently, when one is a spunky WWI nurse with a heart of gold and a brain of … steel (trap)? Whatever. I liked that this series defied some of the typical conventions. Perhaps Bess is a bit too spunky for the times, but her family (including her highly respected military dad) cautiously encourages her free spirit to a remarkable extent. That’s refreshing, as is the near-total lack of a romantic entanglement for Bess, who while no raving beauty is apparently not a complete “antidote” (yes, I’ve been reading too much Georgette Heyer lately). Will I continue with the series? Oh sure, why not? I liked Bess and I liked her dad and his faithful batman. I’m curious to know what she gets up to next. It’s a helluva thing when an English nurse has to worry more about the murderous deeds of her fellow countrymen than those blasted Germans, though. It’s funny. I thought I had read this book already, but now I realize that what I mistook for a previous, hazily remembered reading was in fact a pickup of the general plot line from watching bits and pieces of the movie starring Sean Penn, which was based on this book. I’m glad I’ve actually read it now, as it was an engrossing and heartbreaking tale of three boys, friends as children until something happens to them as 11-year-olds whose reverberations don’t finish playing out until long after they are grownups. Of the three boys we are introduced to at the beginning, Sean Devine seems the most likely to succeed. None of the boys come from money, but Sean’s family lives in The Point, a slightly more affluent working-class neighborhood of Boston, and his parents place a premium on education and making sure that Sean has choices that they didn’t have. Jimmy Marcus and Dave Boyle are from the other side of the tracks, a lower-rent district called The Flats. Jimmy is a reckless, fearless kid who thrives on breaking the rules. Dave is that kid who is nobody’s friend and nobody’s enemy. He tags along after Jimmy wherever he goes, and Jimmy tolerates him without actually seeking out his company. Then Dave is abducted, and when he returns four days later nothing is the same. When we meet the boys again as grownups, their lives have not gone as we might have predicted. Sean has become a cop, and a good one, but his marriage is a shambles and he’s just coming off a suspension. Jimmy has moved past an earlier life of crime and now is a law-abiding owner of a small convenience store with three daughters. Dave continues to drift through life, where even a wife and a son can’t anchor him to reality and his childhood horror keeps bubbling to the surface in ways he can’t predict or control. It all comes to a head when Jimmy’s teenage daughter is murdered, Sean is assigned to investigate, and Dave quickly becomes a suspect. Lehane layers revelation upon revelation, slowly building the story to a climax that dispenses a rough sort of justice that ultimately nobody can take satisfaction in. I knew Lehane was a fine writer well-versed in dark and twisty subjects. His Kenzie-Gennaro series is a masterful display of dark humor and gruesome tragedy. With Mystic River, he’s created another pitch-perfect examination of the ways in which past and future combine to create an uncomfortable present. This book could be the textbook for a master class in how to convey a sense of place and character strictly through dialogue, which carries all the flavor of working-class Boston in every line. Even if you’ve seen the movie and you think you already know how it ends, you’ll enjoy the scenery along the way. Gwen Florio’s debut novel follows Lola Wicks, a veteran war correspondent, who comes back from Afghanistan to face the news that her newspaper is closing all its foreign bureaus and her new beat is the suburbs. Her editor deals with her loud displeasure by forcing her to take some paid time off to help her adjust her attitude. At loose ends in a country where she has few friends anymore after years on the front lines, Lola heads to Montana to visit a former colleague. She’s shocked when she arrives in tiny Magpie, MT, to find Mary Alice murdered, possibly because she was on the verge of breaking a huge story. But about what? And who was so threatened by her investigative reporting that they felt the need to silence her permanently? Lola throws herself into solving the mystery of her friend’s death, and all that time spent asking tough questions and being shot at in combat zones comes in surprisingly handy in rural Montana. No one, it seems, wants to talk to her about what might have happened to Mary Alice. But are they just small-town folks closing ranks on a stranger, or is one or more of them hiding something? She’s determined to find out, and the search for answers leads her to the nearby Indian reservation and beyond. The mystery element here is pretty straightforward, with plenty of clues scattered about and a general sense of an author playing fair with her readers. Though the writing seemed a bit pedestrian at times, I found Lola and several of the lesser characters to be well-drawn and engaging. Some scenes early on hinted that Lola returned from Afghanistan the same way many combat soldiers do: with a raging case of post-traumatic stress disorder and a jumpy paranoia. But Florio does a good job of using the PTSD and Lola’s combat experiences sparingly, in ways that complemented her main storyline without overwhelming it. All in all, an enjoyable debut novel. Lola Wicks is a character worth keeping, and I’d happily read more of her journalist/investigator adventures. I usually tell people who ask what I do for a living that I am a recovering journalist; I worked at daily newspapers for 18 years before jumping ship and finding a new career path. Nothing that has happened in the media business in general or newspapers in particular has changed my mind about the wisdom of my mid-career change, even as I mourn the ideals with which I entered the business back in the 1980s. I wasn’t sure what to expect from this novel, featuring a nearly washed-up journalist in Richmond, Virginia, who has to battle his past as well as his bosses to find the truth behind a series of murders in his Oregon Hill neighborhood. Willie Black was an extremely appealing narrator and protagonist. I was rooting for him all the way through, and found his ambivalence about facing his less-than-privileged past quite realistic. The newspaper bits also had a ring of truth about them, only a little bit idealized — but then as my colleagues and I always proclaimed, you could never write a true novel about newspapers because nobody outside of the business would ever believe it. This novel was believable as well as enjoyable. I’d like to read more about Willie and his cohorts. I’ve loved mysteries almost as long as I’ve known how to read. I devoured Nancy Drew and Trixie Belden stories as a youngster, and graduated to Rex Stout in high school. Reading more about that author’s creation, Nero Wolfe, I learned that Stout loved the Sherlock Holmes canon, and left clues that perhaps Nero should be seen as the illegitimate child of Sherlock and Irene Adler. That intrigued me, but not enough to prompt me to pick up any Holmes stories. Of course, it’s impossible to be a sentient being on Planet Earth in the 21st century and not be familiar with the basic facts of the Holmes-verse. From 221B Baker Street to “Elementary, my dear Watson!” to the detective’s obsession with detail, his fondness for cocaine, his Calabash pipe and his deerstalker cap are well known even to those of us who have never read a single Conan Doyle text. I decided late last year that it was high time I made a point of becoming acquainted with this seminal detective, and found The Memoirs of Sherlock Holmes available as a free e-book download. I didn’t realize until the last story in the collection that this wasn’t the best book to start with. 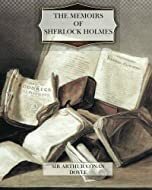 For one thing, it falls more or less in the middle of the Holmes canon, and therefore assumes that the reader is well-acquainted with the backstory of Holmes and his sidekick, Dr. John Watson. Fortunately, as I mentioned above, it’s pretty impossible not to have gleaned enough Holmesian knowledge to be able to follow the stories easily. More problematic was the fact that the book ends with “The Final Problem,” which is the famous story in which Holmes meets his tragic end at Reichenbach Falls. Of course, we know now that it was not the end of Sherlock Holmes, and Conan Doyle went on to write quite a few more novels and especially short stories before finally hanging up his cape and deerstalker for good. The most striking element of these stories, to me, was their relative lightweightness, if that’s a word. Yes, yes, Sherlock pays obsessive attention to detail, and numerous examples of his detecting based on observations that have completely escaped the notice of the police are scattered throughout the stories. But in many of the stories, the solution is arrived at rather too tidily for my more modern sensibilities. (I guess I like to see my detectives sweat a little.) In other stories, the ending is wrapped up rather over-neatly, with Watson reporting that the villain escaped to Europe or some such. I’m not sorry I read The Memoirs of Sherlock Holmes, and I’ll go back to the well and start at the beginning this time with A Study in Scarlet. But I am a bit surprised at myself for not falling immediately in love with one of the most beloved literary characters of all time. One of my co-workers is an enthusiastic James Patterson fan, and has been urging me to give his Alex Cross series a try. I have a vague memory of having read one of the later books and enjoying it, but I wanted to go back to the beginning and get the full background on the characters. This is the first book in the series, and does an effective job of drawing the main characters: Detective/psychologist Alex Cross, his partner, and his family. All of them are engaging characters that i felt I’d be happy to spend more time with. The plot, featuring a psychotic child kidnapper and murderer, was less successful. There’s little suspense in discovering the bad guy; the twist comes with trying to prove whether he committed the crimes while sane or as a “split” personality. Having just read a handful of well-written legal thrillers, I found Patterson’s trial scenes to be less convincing, and I realized I didn’t really care about the technicalities of whether the killer was sane or not since he obviously committed the crimes. More interesting was the smattering of political intrigue within the Washington, D.C., police department and its interactions with the FBI and other agencies. I hope that area is more fully developed in future Cross novels. Sue Grafton chugs relentlessly toward the end of the alphabet. S turned out to be a perfectly serviceable entry in the series, which I experience a little differently than I do other series. For instance, I have devoured repeatedly all of the Nero Wolfe books by Rex Stout, and the characters are so vividly drawn that I like to think of them as living outside of the books. Kinsey Millhone, on the other hand, seems like a very cool chick, and someone that I think I would enjoy hanging out with. But the connection isn’t as intense; I don’t seek out the latest Grafton as soon as it’s published, but I’ll make a point of eventually catching up at the library. Anyway, the series went through kind of a “dark” period somewhere in the middle of the alphabet, when we learned a whole bunch about Kinsey’s childhood and past history. The last few, though, have reverted back to a lighter feel, and S in particular has virtually no detours into Kinsey’s personal life at all. It’s not bad, necessarily (though I sorely missed visiting with her octogenarian landlord Henry). Overall, I’d say if you’ve read and enjoyed the previous vowels and consonants in the series, you’ll probably enjoy this one as well. I don’t think this one will inspire many newcomers to start all over back at A, though. This book is an outlier of sorts in Diana Gabaldon‘s Outlander series. Rather than focusing on the main characters of the series, Jamie and Claire Fraser, this book concentrates on Lord John Grey, a secondary character first introduced in Dragonfly in Amber, the second book in the Outlander series. Lord John is a British soldier who despite finding himself on the opposite side of the Jacobite uprising from Jamie, nonetheless falls in love with him. None of that really matters in this book, however, which has only a scattered handful of references to Jamie. The book concerns Lord Grey’s turns as amateur detective, as he tries to figure out who killed a sergeant from his regiment, who may or may not have been a spy.